Jane Kaufmann would be the first to admit that breeding racehorses – for her anyway – is a hobby. She doesn’t anticipate that it will pave a path to a beach house in the Bahamas any time soon. However, for a self confessed novice, she’s doing alright. On Saturday at Caulfield, Kaufmann’s come-from-nowhere flyer, Eduardo, won his first stakes race by capturing the Group Two Caulfield Sprint over 1000m. It was some win. Just two weeks earlier, Eduardo had finished a head second to I Am Excited in the Group Two Gilgai Stakes over 1200m at Flemington. It certainly has been a remarkable rise and rise for Eduardo who was only first sighted at Moe in June when winning his maiden – by six lengths – over 1117m. Courtesy of the Caulfield Sprint, he now has three wins and two seconds from five outings. Incredibly, Eduardo was a winter 4YO when making his debut. Kaufmann first got into breeding about 10 years ago, purchasing a Sovereign Red mare, Tootsie Goodbye, for $1,000 at the Inglis December Sale. “My daughter was into Eventing and I actually went to the sale looking to buy something for her, when I saw the mare,” Kaufmann reveals. “She was in foal to Khyber Pass and produced Bye Bella, who won three races. “Then I purchased a Rubiton mare (Bucolic) quite cheaply and she ended up producing Freelander who won a race for me too. “I paid a bit more for Eduardo’s mum, Blushing – $4,000 – at the 2010 Inglis March Sale, but I liked her because she was in foal to Domesday. The Domesday colt (My Angus) was a winner and placed in town, her next foal was a filly called Watch Me Blush, who is likewise a winner and raced by Nick, and then along came Eduardo. (Unfortunately, Blushing died and Eduardo would be her last foal). Originally an apprentice jockey in Tasmania (“had only a dozen or so rides but first one was a winner!”), Zschoke shifted to the mainland after one season as a trainer in the Apple Isle. 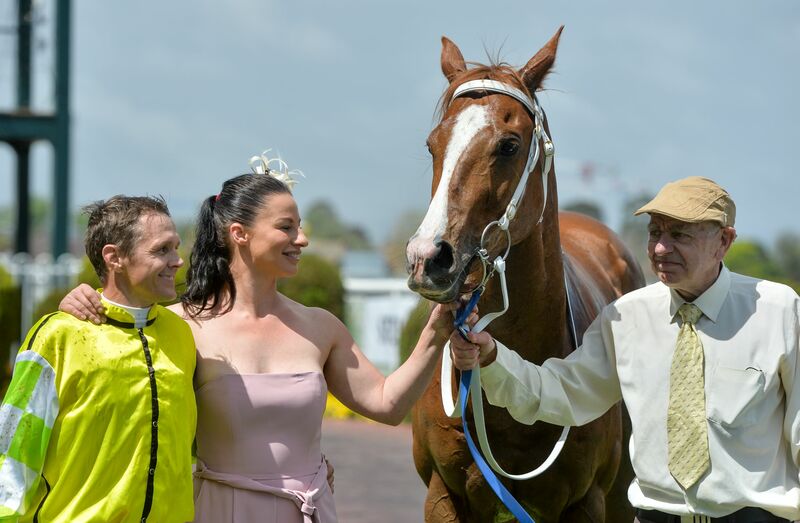 “I’m about 10 minutes from Cranbourne racecourse and I don’t box the horses but keep them all in large yards … in their natural environment,” Zschoke points out. “It’s only a small team and I’ve had about 12 winners to date, but clearly Eduardo is the pick of the bunch. “I got him (Eduardo) as a late 3YO and he arrived with a couple of other horses and I said then if any of them are any good it will be him. He got broken in, had a couple of short preps, then tipped him out for a while due to a minor foot problem. Eduardo has been ridden in each of starts by Zschoke’s partner, Brian Park, who steered Zip Zip Aray to win the 2002 Group One Goodwood Handicap in Adelaide, but would declare on Saturday – rather diplomatically! – that Eduardo’s Caulfield Sprint was his greatest thrill to date. Eduardo’s victory also proved to be a timely boost for his sire, Host, becoming the Willow Grove Stud based stallion’s sixth individual stakes winner. Timely? It certainly was according to Willow Grove’s Ralph Satchell who watched the Caulfield Sprint while at the Morphettville races and was approached shortly after by a breeder who booked in a mare. “A bloke just walked up to me and asked ‘do you stand the sire of that winner?’. Matter of fact, I’ve had three phone calls since Eduardo’s win, all from breeders sending mares,” Satchell reveals. “We got Host in 2015 from Swettenham Stud where he had stood since coming to Australia in 2008. Standing an “unbroken line of stallions since 1979”, Ralph and Linda Satchell’s Willow Grove has played host to some of South Australia’s best including Holborn, Blazing Saddles, Keepers and Stargazer. “Host is quite the character: a really sound horse with a lovely nature about him, but is utilised more as a breed to race horse these days,” Satchell adds. “That said, his progeny won $1.5 million in stakes last season and he’s currently South Australia’s leading active sire. What’s more, Host’s oldest since shifting across have just turned two and three of the yearlings sold in Adelaide this year were knocked down for $65,000, $41,000 and $30,000.